Starting at age 40 your reading vision begins to decline. In the 50’s and 60’s your risk for cataracts, glaucoma and macular degeneration increases along with eye floaters, dry eyes and adjusting to lighting conditions. At age 70 and older the color vision declines, visual fields narrow and most people will develop cataracts. 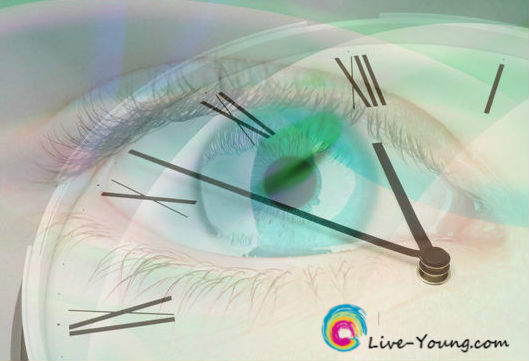 To slow down the aging process of your eyes…keep reading all the way to this section – > What You Can Do! Cataracts cause a cloud over the eye lens distorting your vision. Corrective surgery is relatively safe and may even reduce the need for reading glasses. Eye Floaters are spots in your vision that drift about when you move your eye. Usually not considered a serious problem but could signal the beginning of a detached retina. Glaucoma is excessive fluid in the eyeball that creates pressure damaging the optic nerve and can cause complete loss of vision. Macular Degeneration is a major cause of vision loss including blindness in seniors. Slide show: Age-related Vision Problems from MayoClinic.com – great visual comparisons of healthy eyes to age-related vision problems! Whenever possible it’s best to get nutrients from your foods more so than supplements. Good Foods for Eye Health from WebMD.com – good list of more healthy foods for eye health! Antioxidants help keep our cells and tissues healthy and strong plus are important for maintenance of good health. Lutein protects the cells from damage and reduces the risk for both cataracts and macular degeneration diseases. It is considered one of the top nutrients for eye health. Omega-3 fatty acids decrease the risk for macular degeneration by reducing inflammation and preventing plaque from forming. Vitamin C and E work best together and are known as one of the top antioxidants keeping tissue healthy and providing maintenance for good eye health. Zinc helps prevent blockage to the arteries that feed oxygen to the retina reducing age-related eye diseases especially macular degeneration. Wear sunglasses to protect your eyes from the sun to reduce your risk to age-related eye diseases. Eat healthy nutrient packed foods and skip the fast food line. Get plenty of sleep averaging at least 7 to 8 every night. Schedule an eye exam at least every two years and take action on vision correction options. Avoid rubbing your eyes which can cause damage to your vision plus increases wrinkles around the eye. What other prevention tips do you have for healthy vision as you age? I’d love to hear from you! Opt-in for healthy blog posts right to your Inbox every month and receive my Free eBooks! Follow my pins including healthy recipes I’m trying on Pinterest.